‘DIY Introduction...’ - this is my first ebook originally called 'Slow & Steady Steps...' and published in February 2012. It is a basic introduction to personal finance and covers issues of debt, savings, pensions and investments. In the final chapter I have provided a couple of practical example of using a combination of investment trusts and low cost index funds/ETFs. 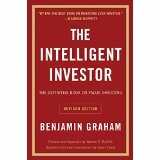 The book was updated with the new title in Feb 2017 to reflect the significant changes to pensions and ISAs as well as to reflect developments to my investing strategy embracing index funds. 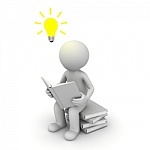 ‘DIY Pensions’ - this was originally published in January 2013 and is a guide to anyone who is thinking of managing their own pension affairs via a low cost diy sipp. It attempts to cover the differing approaches to building a pension pot, looks at the option of income drawdown and how to manage a flexi-access drawdown portfolio. I also include a chapter looking at the new flat-rate state pension introduced in 2016. The book was last updated in 2019. (ebook £3.95 incl. vat - free loan via Amazon Prime & Kindle Unlimited. 'DIY Income' - this ebook was published in May 2014 and looks at the various ways to generate income from shares, investment trusts, ETFs and bonds. It expands upon the final chapter of 'DIY Introduction...' and is aimed at those who are struggling with the low returns from cash savings and wanting to explore the options of securing a higher return on savings or pension lump sum. Customer Reviews "An excellent read, well presented information and if you are like me self employed a great guide to building a pot for the future" Ian(Sept 2014). 'DIY Simple Investing' - this is my latest book published in June 2015 and is a guide to help anyone and everyone to better understand the investing process. Most ordinary people lead busy enough lives without having to think about stocks and shares, pensions and ISAs. Maybe all they really want or need is a simple, low cost solution which makes sense and which they can implement with a minimum of fuss. The book therefore suggests a very low cost, simple all-in-one strategy for developing a no frills investing option using Vanguard's LifeStrategy index funds. It reflects the changes to my personal approach to investing which now embraces more passive, low-cost index funds. "We have seen much more money made and kept by 'ordinary people' who were temperamentally well suited for the investment process than by those who lacked this quality, even though they had an extensive knowledge of finance, accounting, and stock market lore". "With every new wave of optimism or pessimism, we are ready to abandon history and time-tested principles, but we cling tenaciously and unquestioningly to our prejudices". 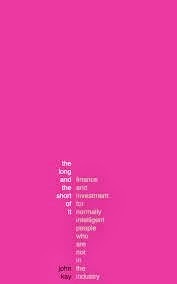 "The Little Book of Common Sense Investing" by Jack Bogle (founder of Vanguard). The title really says it all...a short read but packed with lots of thought-provoking ideas which will serve both beginner and seasoned investors well. Bogle shares his own time-tested philosophies, lessons and anecdotes to explain why outperforming the market is an investor illusion, and how the simplest of investing strategies - indexing - can deliver the greatest return to the greatest number of investors. ..."while such an index-driven strategy may not be the best investment strategy ever devised, the number of strategies that are worse is infinite". 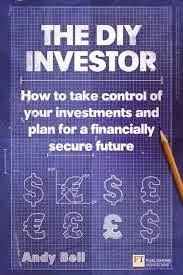 'The DIY Investor' - How to take control of your investments and plan for a financially secure future - (October 2013) by Andy Bell. The book is aimed at anyone who is thinking of, or currently managing, their own investments. It is not a get-rich-quick book, nor is it anti financial adviser. The Investing Demystified video series is based on the premise that most investor can’t beat the market (or pick investment funds to do so for them). Those investors should only buy world equity index trackers for their equity exposure, and can easily implement the simple and cheap portfolio tailored to their risk profile. They will most likely be far better off in the long run as a result!